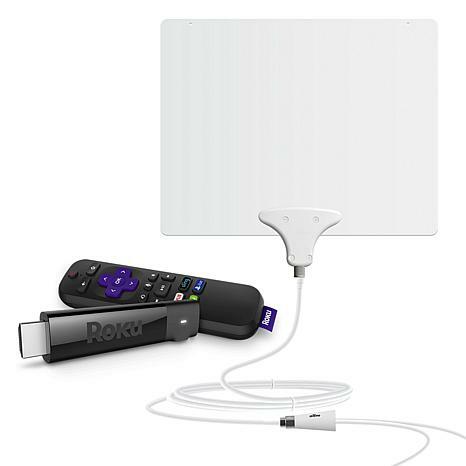 Roku and Mohu have come together to meet all your home-entertainment needs. 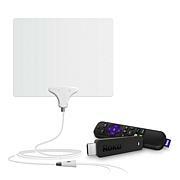 Stream your favorite movies, TV shows, music, sports or news programming at home, in your backyard or in a hotel or dorm on the Roku media streamer. Plus, the Mohu antenna delivers your favorite over-the-air channels for free — from up to 50 miles away! Best of all, you can enjoy both in up to 4K Ultra HD, where available. That's what we call a home theater win! Hotel and Dorm Connect requires a wireless-enabled hotel or dorm. Use a Web browser on your wireless-connected smartphone, tablet or laptop and sign in to enable your previously activated Roku device with Roku OS 7 or higher. 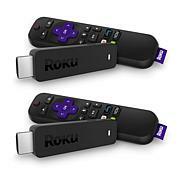 You need an adaptor, HDMI cable and Roku remote (the Roku Mobile App remote does not work with this feature). Content may be limited or unavailable. Weight: Roku - Approx. 14.4 oz. Antenna - Approx. 3.68 oz. 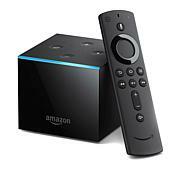 Happy-Received on time, very easy to install Roku and the antenna. Unfortunately we live so remote than the antenna would only give us 5 channels. Good news is one of them was a cartoon channel if we had little ones. Sad- we need to get one that has a lot longer range so we had to send back. Both work absolutely as described if we lived closer than 75 miles to town. We definitely will recommend. I am giving roku the five stars. 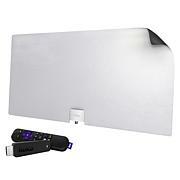 The included mohu leaf antenna does not do anything as promissed. I'm happy with the roku stick 100%.